I am sending my H&R Pardner 12 gauge in to be fitted with a new 20 gauge fully rifled slug barrel. H&R has an amazing barrel accessory program. This is how it works: You choose from one of dozens of barrels they offer, ship your frame to them, and they ship it back with your new barrel. You can choose from almost any gauge and if you have one of their rifles you can choose from tons of different calibers. The price of a new barrel is between $55 and $120 dollars. A whole lot cheaper than buying a new gun. Several years ago I had them put a goose barrel on mine. The transaction was easy and the barrel is amazing. I have several shotguns, but for wing shooting the Pardner is my favorite. It is light and fast. When pheasant hunting I could usually get my shot off before anyone else shouldered their gun. I have taken more game with my Pardner than all of my other guns combined. I have rarely felt handicapped by the single shot. Along with the slug barrel I have the option to purchase a second barrel without an increase in shipping costs. I have decided I want a small bore shotgun. I want something that hopefully my wife will shoot and eventually I can teach my daughters with. I want a small bore simply for the low recoil. I know my wife will not shoot something that she perceives is uncomfortable. As a kid I remember my mom shooting my 20 gauge. She disliked the recoil so much she has refused to shoot anything ever again. So, I'm looking for something smaller that a 20 gauge. The 410 comes in two sizes, a 2 1/2 inch and a 3 inch. According to Remington the 2 1/2 inch shells have a 1/2 oz load going at 1250 fps. Their 3 inch loads have 11/16 oz of shot and travel at 1135 fps. This means that if you use a load of 6's each 2 1/2 inch shell will have 112 pellets and the 3 inch shells will have 155 pellets. 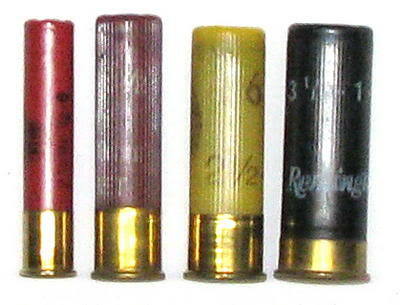 The 28 gauge shell is 2 3/4 inches long. Remington only has one load size listed. It is 3/4 oz at 1295 FPS. Winchester sells a 1 oz load that travels at 1205 FPS. A 3/4 oz load of 6's has 169 pellets and a 1oz load has 225. Both boxes of shells can be purchased at Bass Pro Shops for an astronomical $18.99. The least expensive I could find at BPS was a Remington target load for $10.99. Lets stop and talk for a moment about what makes one shotgun more "powerful" than another. If you go to a ammunition manufacturers web site you will notice that the difference in FPS from a 12 gauge 3 1/2 inch magnum to a .410 bore 2 1/2 inch target load is less than 200 fps. 200 fps is not much. You will also notice that both the 12 gauge and the 410 shoot the exact same pellet. So, a single pellet from the .410 is just as deadly as a single pellet from a 12 gauge. The difference is that the 12 gauge has more pellets. A whole lot more, 338 more. That is 4 times the amount. So it is safe to say that a 12 gauge 3 1/2 inch magnum is 4 times as powerful as a .410. The pellet count determines the lethality. Lethality is not the only issue though. Recoil is an equally important factor. There are so many factors that it is difficult calculate this data. It appears that that the 28 gauge has slightly less than twice the recoil of a .410. A 28 gauge has about half the recoil of a 20 gauge. Notice that the pro's for the .410 are mostly economic and the pro's for the 28 gauge are performance. There is nothing more demoralizing to a new hunter than wounding game. A new hunter needs every advantage they can get. That is why I am going to choose the 28 gauge. It will be expensive to feed, but I believe it is the best gauge for my needs. I would like to get a .410 someday. I can see why it is such a popular shotgun.